I love the products (especially the eye cream) - there is a definite > > improvement in the appearance and feel of my skin. I look and feel > > younger! Thanks so much. When I began chemotherapy for treatment of my Multiple Sclerosis I felt like it meant I was going to die. I didn’t know what to expect. I knew chemotherapy was used to treat cancer and so I thought my MS had progressed so much that now I needed chemo. Those feeling all went away once I started chemotherapy infusions but what I didn't expect was what happened to my skin. My skin, which was always so sensitive, became even more sensitive and dry. It became very thin and fragile. I even developed acne which I never ever had in my lifetime even while growing up. Then I heard about Looking and Feeling FAB, Inc. I filled out the application and had my doctor sign off. Then I was introduced to Holly Brown and Image Skin Care. They both literally changed my life. As soon as I applied the Image products my skin felt healthy and smooth. I had never been able to put a product on my face that didn't completely turn it red. As the days went on and after subsequent visits with Holly people actually started to notice. I couldn't believe when people would say that my skin looked amazing. I even used the products on my hands and nails which became very brittle and sensitive. Now I can wash dishes and take a shower without feeling like my nails are going to crack and fall off. I am so thankful for Holly and Image skin care. I tell everyone I know who suffers from health-challenged skin about the program and about Image Skin Care. I feel like a human being again and not an old leathery lizard. People have been telling me how nice my skin looks. I can’t believe that people actually have noticed. Since suffering from cancer my skin was the most problematic issue I had that sunk my self confidence. Meeting Holly and being introduced to Image Skin Care has really made a difference in my overall health and well-being. Everyone has days that I call “life changing events”. You remember where you were when the event occurred, perhaps what you were doing, who was with you, the weather, or even what song was playing on the radio. Well I had a day like that not too long ago. June 3, 2013. It was a Monday and it was a beautiful day. It was also the day I found out I had breast cancer. "Looking and Feeling FAB, Inc. and Image Skincare have dramatically improved my life and I am eternally grateful! When I was diagnosed with Lupus several years ago, I had a host of skincare problem and light sensitivity that was extremely difficult to care for. Although, I still have extreme sensitivities to both products and to sunlight, my regular skincare treatments with Holly Brown, Lic. Aesthetician/Looking and Feeling FAB, Inc., as well as the homecare products from Image Skincare, my skin for the first time in my life feels healthy and rejuvenated. I can confidently say IMAGE has transformed my skin and also my confidence. As a sports model there is always an expectation and pressure looming to look immaculate at all times. Before I started using IMAGE my skin always had a rough undertone which would have continual flare ups of pimples, which would become blemishes that stuck around for what felt like forever. But within a week of using my IMAGE skincare my skin completely resurfaced and the rough bumps smoothed and disappeared. Not only has it tightened and re-plumped my skin but there are no more blemishes or flare-ups at all. After trying many different face products I have finally found a product that has transformed my skin and I can face everyday with confidence. I no longer bother wearing foundation now, I just pop on a little powder and I’m ready for the day. I recommend this product to anyone who wants to transform their skin from deep within. Thank you IMAGE you have changed my life. Hello:) my name is Holly. I am an esthetician in Tennessee and have been using IMAGE at my spa for 1 year and I cannot explain how pleased my clients and I are! These products are incredible! Thank You IMAGE!! I just wanted to take the opportunity to thank you for creating a line of treatments and products that has helped me "change lives!" Although I do utilize the anti-aging treatments and products of IMAGE with my clients, my true passion is working with teens, and adults suffering with acne. My success has been incredible. Working so closely with teenagers and their parents to help them overcome the "setbacks" acne has had on their lives is the most rewarding part of my career. I have watched so many teens turn into completely different people. Their newfound self-esteem and confidence changes everything in their lives from better grades, more involvement in sports and school activities, to all around better attitude with family members! I cannot begin to express my gratitude and appreciation to Elisabeth Wilson who has been extremely helpful with training and assistance over the last six years. Lastly, I am very proud to be a part of your "IMAGE TEAM." I continue to look forward to changing lives because of what you have created! Thank you. I am so greatful to have discovered this company at a beauty show! My skin and life is changed forever! I struggled with acne for over 15years and now my skin is clear and glowing! I notice how much more healthier it is and radiant! I used to be afraid to look at people because I thought all they could see was my acne, but now I walk out the door and face the world without make-up and proud of it!! Thank you so much Image skin care! I wish I would have taken before photos, but there was no way you would get me in front of a camera, but now I will proudly take photos because there is not a single acne lesion, my skin looks amazing! I tell everyone about Image and not a single one of them will use anything, but image ever again. As always, my experience has been nothing but outstanding with Image. I started using Image and some other product lines in school, and I have stuck with Image for the outstanding quality of products, terrific treatment of estheticians and the professionalism of all the Image reps. I have never spoken to a rep who hasn't gone out of their way to assist me. I recommend Image to every up and coming esthetician I know, and I finally had the opportunity to bring Image to my place of employment which is exciting. Thank you for wonderful products and great customer service. We have enjoyed Image Skincare in our practice, for retail sales and for our treatment “back bar” over the past 4 years. Image products are packed with active ingredients that really do what they say they do, utilizing the latest in skincare research. We rely on the right combination of Image’s treatment products to insure optimal results for the innovative laser, and other corrective skincare treatments we provide at our Center. Our clients expect the best and our medical estheticians and I can rely on Image’s safety and efficacy every time. As a nurse practitioner specializing in Aesthetics I have had to learn about skin care products and treatments via the company’s extensive hands on training and product knowledge, as well as techniques for in office applications of peel solutions. Along with this support, after 3 years of use these products have proven themselves to have safe reproducible affects in office for treatments which reassures to me the quality of Image Skin Care. Also the line has something to offer for all skin types and desires. I am so satisfied with each product that I can easily incorporate it into each client's regime, and yet, after using even one product from Image Skin care, most clients come back asking for additional products to replace more expensive medical skin care. Both aggressive and beginner treatments and products are superior to most all other skin care lines I've ever used and sold. Thank you Image Skin Care! Dr. Tayfur R. Ayalp, M.D. I am a very satisfied customer of Image Skincare and have been for the last 2 years. I cannot say enough good about the products themselves. They are affordable and very effective. All of my clients that have switched to Image Skincare products have noticed remarkable results in the overall appearance of their skin. Our acne patients have experienced dramatic improvements in their acne treatment with the addition of Image chemical peels vs. using prescription oral and/or topicals alone. We have been using the Image Skincare line now in our medical office for about 2 years and could not imagine being happier with another line. As a result, we have discontinued the use of Obagi in our practice. Image Skincare allows you to mix & customize all of their products to compliment any skin type or condition, whereas most professional lines make you pick a skin type of normal, dry or oily. For example, I have patients on the Ageless Anti-Aging Serum that mix with the Total Pure Hyaluronic Acid for hydration. Image has also found a way to be effective with the use of peptides, stem cells, retinols, salicylic acid, glycolic acid, and lighteners while also being affordable. Not sure what else you could ask for! We have been using Image Skincare products and treatment protocols for over 3 years with HUGE success in treating various skin conditions including acne, rosacea, & hyperpigmentation. Results with home care and clinical treatments are reliable and consistent. The broad range of products allows for better individualized treatment for each client and his or her specific skin care needs. Image stays on the cutting edge of skin care, improving and updating the ingredients in their products to produce better results with fewer potential reactions and side effects. Our Territory Manager also provides unparalleled customer service and educational opportunities for us as clinicians. We are completely satisfied with our experiences with Image and look forward to a long and prosperous partnership! I was first introduced to Image Skin care products in August 2012. What I like about this skin care line is that there are different product lines for each skin type. I have used the product and love it. The vital C hydrating facial cleanser has a lovely orange scent. I have sold other skin care products in my practice and I didn't feel like they addressed each skin type well. They were also very costly to the patient. The Image skin care products are result-oriented and meet the skin care need of my patients. It is budget friendly and we have patients buying an average of 4 products. I had one patient who expressed to me how much she liked the Clear cell skin line and could see the immediate difference in her skin. She is one of my patients that has tried the other skin care lines I have offered. I am very pleased with Image skin care from their customer service to my representative. I have found the skin care product for my practice: Image Skincare. I feel Image is a great skin care line because it has effective products that target all skin types along with their associated conditions from sensitive skin to newly aging skin to sun-damaged skin. We have been incredibly pleased with our relationship with Image. Image has been a part of our practice since 2007 and has helped us grow our retail sales and client retention along the way. Our skincare specialists have freedom to sample products to patients who are unsure of what they are looking for and patients who are concerned with their personal reaction to certain products. Our confidence in Image allows us to sample a product to a patient and know that they will come back for at least one of the products we have given them to try. Image has a great price point as well as a product for everyone. We look forward to growing in our practice along with the help of Image. I like that Image Skincare offers versatility as well as visible results. Products from different Image lines can easily and effectively be used together to create customized daily skincare protocols for my patients. We have been using the Image Skincare line in our MediSpa and Medical Office for almost 3 years and are extremely pleased with all aspects, from the quality of the products to the educational support. Image Skincare offers all the latest ingredients such as peptides and botanical stem cells which give us the ability to provide our clients/patients with the most current solutions to their skin care challenges. Both the retail line and the professional resurfacing products allow complete customization instead of the “one size fits all” concept many manufacturers offer. Image is the only line of products that truly meets our needs. We have tried many other skincare brands in the past, but have never been so pleased. Every customer deserves the best treatment customized for their skin type. We've been very successful with the new MD Kit, chemical peels, lighteners for anti-aging, rosacea, treating melasma, acne etc. It is also nice to work with professional people that answer any question that I or the customer may have. Image peels are a great tool for us to keep our patients happy and their skin healthy. The peels perform exactly the way they’re supposed to: from a light exfoliation with vitamin c to a deep treatment. Image has an array of acids that cater to every skin type and condition. The post-treatment kit is also very effective in making sure our patients have the proper protocol at home during the critical healing time. Image products deliver with the best quality and price point. Since bringing on the Image Skincare Line of Products over a year ago, I have been consistently impressed with the results we have seen in EVERY client. I also enjoy being able to tell clients that we offer one of the cleaner lines that still offers such fantastic results. My favorite clients to treat with Image products are those with persistent, dry rosacea. I can think of three in particular that started home regimens at about the same time. Within two months, each of them had come in at different times just to show off their skin. At Dermatology Associates of Northeast Florida, we believe that education is one of the most important aspects for patients trying to find the best service for their anti-aging needs. We have had several 'Cosmetic Dermatology 101' evening seminars for our patients and introduced them to the Image line a couple of years ago. Our patients are extremely pleased with the products, and are showing a marked improvement on their different skin types and conditions. In this economical time our patients also appreciate that they are getting pharmaceutical grade products that are affordable, and really work! Our personal favorite, the Signature Facelift, is a huge success. In my practice of over 10 years, I'm very proud to use and recommend Image Skincare products and treatments. They are very secure, effective and the patient can see results the same day or in a few days, depending of the patient's skin condition. Also the follow up home treatment and products can be acquired at affordable prices. I particularly love all the chemical peels, particularly the Beta Lift Peel for acne patients. Thank you Image Skincare! Image Skincare is THE exclusive line at Desert Plastic Surgery. Our patients need an excellent skincare regimen not only before they commit to surgery, lasers, or injectibles, and the Image post care is crucial for healing and maximum results. We love the post-treatment kits! The I-Conceal foundation has been a remarkable addition. We can use it right in the office after all procedures. We have truly seen the positive effects of Image Skin Care in our patients and we love hearing how Image Skin Care has changed their skin. I have been using Image skin care products in my practice exclusively since I opened. I would highly recommend this line for its effectiveness and the high quality ingredients in the products. As long as I can remember, I have always struggled with acne. I don’t mean severe, cystic lesions, but hormonal acne that was persistent if nothing else. There is not a time that I can look back and see myself with clear skin. The breakouts accompanied me throughout my teens, into adulthood and then motherhood. There was not a product at the drug store that didn’t go on my face. I even had a few prescriptions over the years written for me – some pills, some creams. None worked! Occasionally, if my wallet allowed, I would splurge on a department store cleanser or cream, only to find myself in the same pimply predicament. Eventually, thanks to acne, two kids and LOTS of sunbathing in my youth, I came to suffer from not only breakouts but hyper-pigmentation. Some hyper-pigmentation was melasma. Some was post-inflammatory. All of it was depressing! 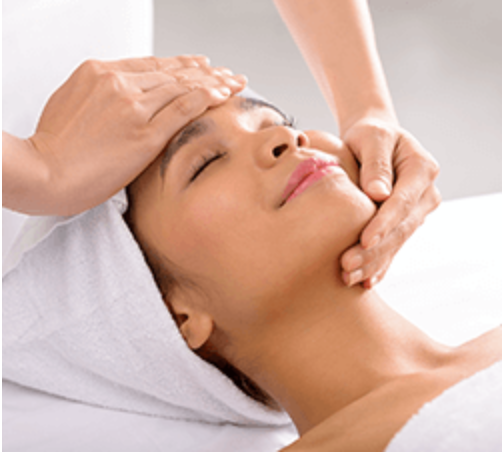 Even as an esthetician with access to such a vast array of products and education, the skin issues never ceased. (No one wants a facial from a skin care therapist that can’t even tend to her own problems!) It is not only bad for my self-esteem it is, in my opinion, unprofessional. Fast-Forward a couple f years… A professional mentor of mine was giving my brows a much-needed shaping after a bit of neglect and in passing she starts telling me about a new skin care line at her salon. It definitely sounded good, and I liked the way it was packaged, but at the time we were using a different product line at the salon where I worked. Image went back to my mental filing cabinet until it was time for me to make the move to a bigger salon. The first company that came to mind when I needed to select a product line was Image. We are a match made in skin-care Heaven! Renee Clairmont, an extraordinary educator, guided me from the very beginning. Once I had Image in my treatment room and on my skin everything had changed: I was able to start offering more professional skin care treatments and get results! The peels are the best addition to the menu – clients love what they are seeing in the mirror, and as a client myself, my skin has never been better. Upon making the switch to the Total Facial Cleanser those pesky breakouts on my chin ceased. Image serums and Daily Defense are the armor I need to ward off any further sun damage that the Perfection Lift (and in the past Jessner’s Lite) have worked to eradicate. I have since converted my sister, niece and cousins over as loyal Image users. And when I’m on Facebook, Twitter (or any other platform) I am singing praises about their life-changing product. Thank you, Image, for this tremendous opportunity, not only to heal my skin, but to grow my business and continually advance my education. I am grateful for this!! I have personally used Image Skincare and have been very happy with the results of my skin improvements. In the short time I have offered your product line I have found that my patient retention has increased and everyone has been pleased with results as I have. The number one compliment is the affordability of the products themselves as well as the effectiveness. With many competitive medical grade skincare lines available I have found it to be the highest quality and effectiveness especially for the price and appreciate that I can offer something for everyone. I would also like to compliment the service I receive when I place and receive orders, the ordering process is always simple with friendly and efficient service and my order comes in a timely manner well packaged. I am very enthusiastic about offering your skincare line to my patients and look forward to being part of your growing future. Had to write to rave about Image Ormedic Eye Gel! I had a facial where this product was used. Came back after and asked what is was, because it was the first product I ever had applied to my eyelids that did not irritate my eyes (plus it smelled so good.) Bought my first tube. Now that I have been using it daily for a while, I find that my eyelashes are growing longer and thicker. I have always had ugly, stubby lashes. But, the products advertised to make them grow are costly, require prescription and reportedly are irritating to the eyes. I am thrilled that I found something that improves my lashes while protecting my skin, without the downside of other. I’m telling all my friends. You have a customer for as long as you make this item. I have used your product for about a month and I am seeing major improvements! Was using ProActive before and even medicated gel from the doctor. So far this product is sooo much better than the rest. Thank you Janna for making a skin care line that works for my skin. Thanks also goes to Rihanna at the Body Massage Wellness Spa in Denver for showing me this product. She knew what I was going thru with my hormonal(PCOS) acne and said this product worked great for her. I will tell anyone who asks that Image Skin Care works wonders and that they should start today!!! I also noticed your products being used on the ‘Real Housewives of Beverly Hills’- great advertising there for you too. Best skin care products!!! Thank you Image for giving me beautiful skin!! Thank you Image for supporting Skin Care Specialists with such great education and the products to support it. Our clients and we appreciate it. Health for Life , Melbourne Fl. I first learned about Image Skincare over two years ago during my Clinical Skin Care training. I have been exposed to other product lines since then, but Image is what I have at home and use daily. My clients, and others, say my skin looks great! Love the product! As an Esthetician I can tell you that Image products are great and would recommend them highly..I especially love the Vitamin C and ageless line. Thank you Image Skincare and Happy Holidays! I love this product!! I've tried everything at the department stores and compares to this product. I had so many compliments on my skin. After awhile I didn't need face makeup. The best!! Keep up your great work!! The product is awesome, I have been using it and my skin is so much softer. This and the internal changes from Juice Plus makes for a very youthful looking ME. Your products have been a god send. I haven't had one breakout since I began using the Salicylic Gel Cleanser & the Daily Defense Matte Moisturizer keeps my face oil-free all day - something I never thought possible. These products are amazing! you won't be let down! I am so glad I found this product line!! It "ROCKS".